The centerpiece of this design is a potted tree that is executed in staggered units of Tied Oblong Cross. 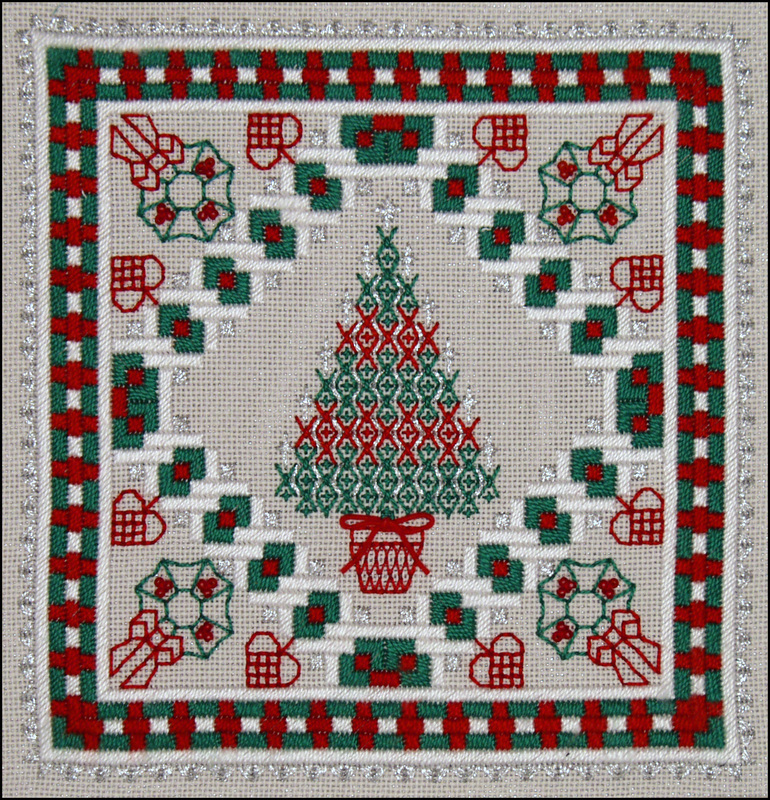 In the holiday version, the tree is divided into alternating green and red segments. In the Autumn version, the tree is more delicately shaded and uses a Wildflowers overdyed thread with three accent colors. Both versions have tiers of lighted candles on both sides, and the pot is embellished with the same reversible blackwork pattern and a tied velour bow. The double border of the design combines two original composite patterns that both use all satin stitch shapes. The interior diamond outline combines a decorative "X" or bow shape with Mirrored Chevrons and Scotch units. The exterior square border combines an Enlarged Tent edge with interior elements that include two sizes of Cashmere units and Scotch stitches. The result is sort of a plaid grosgrain ribbon effect that balances well with the diamond ribbon. A decorative saw-tooth edging surrounds the square border, and these are created with pairs of Mirrored Milanese units. The triangle areas between the two borders have blackwork outlines that reinforce the theme of the design. The Christmas example has a wreath that is flanked by Danish heart ornaments. 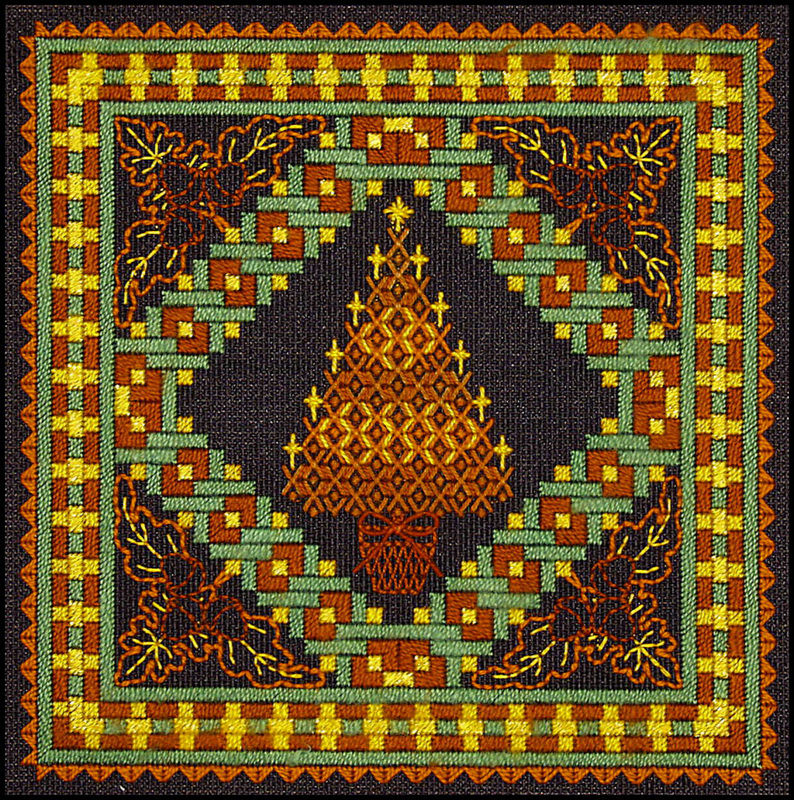 The autumn example depicts oak leaves with acorns. The Christmas example has red beads on the wreath to simulate berries and has silver metallic accents. The autumn example uses a Renaissance Shimmer for its metallic accent and has no beads. The remaining threads are pearl cottons in both examples with weights adjusted to the canvas size in each case.